If your baby stopped breathing, would you know what to do? It’s a situation that all parents hope they’ll never face, but it pays to be prepared. With a baby on the way, at the end of February former wrestler and actor Dwayne Johnson (The Rock) posted on Instagram about how he and his family took a course on preventing choking and performing CPR on infants and children, drawing attention to something which may not cross the minds of many expectant parents. Is it time for you to learn baby CPR too? According to research by St John Ambulance, only one in four parents know what to do if their baby stops breathing, despite it being their biggest fear. Studies suggest almost 60% of parents have no first aid knowledge at all, despite around 76,000 children under 14 having to be admitted to hospital for accidents in the home each year, over 40% of which are younger than five years old. We highly recommend that parents, particularly those with young children, learn some vital first aid skills. Safety First Aid Training have one day and two day paediatric first aid courses which are ideal for parents, teachers, child minders and anyone else who works with children. 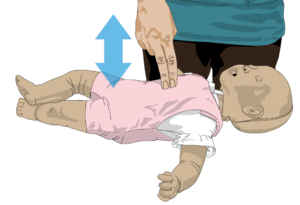 Performing CPR on adults, children and babies requires different techniques. The following steps apply to babies under a year old. 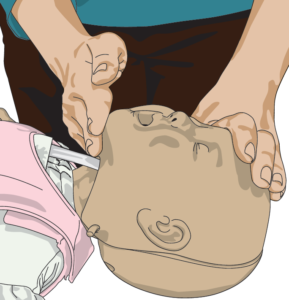 If your rescue breaths are not making the chest rise, check in the mouth and remove any visible obstruction, then make sure there is enough head tilt and chin lift. Do not interrupt compressions by more than 10 seconds to attempt 2 breaths. The best way to ensure you’re able to perform lifesaving CPR on a baby is to take a first aid course. Contact us if you would like more information about Safety First Aid’s first aid courses for children and infants. If you haven’t got a first aid kit in your home yet, you can buy one here.